Our free quarterly magazine draws on Lincoln Institute research to explore land-based solutions to social, economic, and environmental problems. 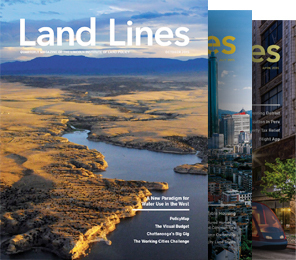 Connecting the dots between our expertise and major global challenges, Land Lines shows why land policy matters. The Lincoln Institute’s quarterly magazine draws on our research to explore land-based solutions to global social, economic, and environmental problems. These reports and briefs deliver concise, evidence-based recommendations for policy makers, community leaders, and concerned citizens. Our books present deep, comprehensive explorations of critical land-use issues by global experts. Conference and working papers offer a wealth of seminal scholarly research on the use, taxation, and stewardship of land. Multimedia offerings include the Making Sense of Place documentary series, Spanish-language video content, a radio series produced by NPR, and more. Brilliantly curated and edited, these essays offer fresh ideas about how to integrate our understanding of the human condition and the health, vitality, and sustainability of the planet. Joan Youngman makes clear, cogent arguments in support of the property tax . . . while dispelling myths and dealing with complex policy issues in a clear, concise way. An abundance of books champion the cause of compact urban form. But one is hard-pressed to ferret out a better effort at distilling the essentials of density than this book. This landmark study combines an ambitious new history of global urban growth with a surprisingly simple and convincing set of policy recommendations. This guide gives practical information to housing advocates and policy makers about the economic impacts and the nuts and bolts of designing an equitable inclusionary housing policy.